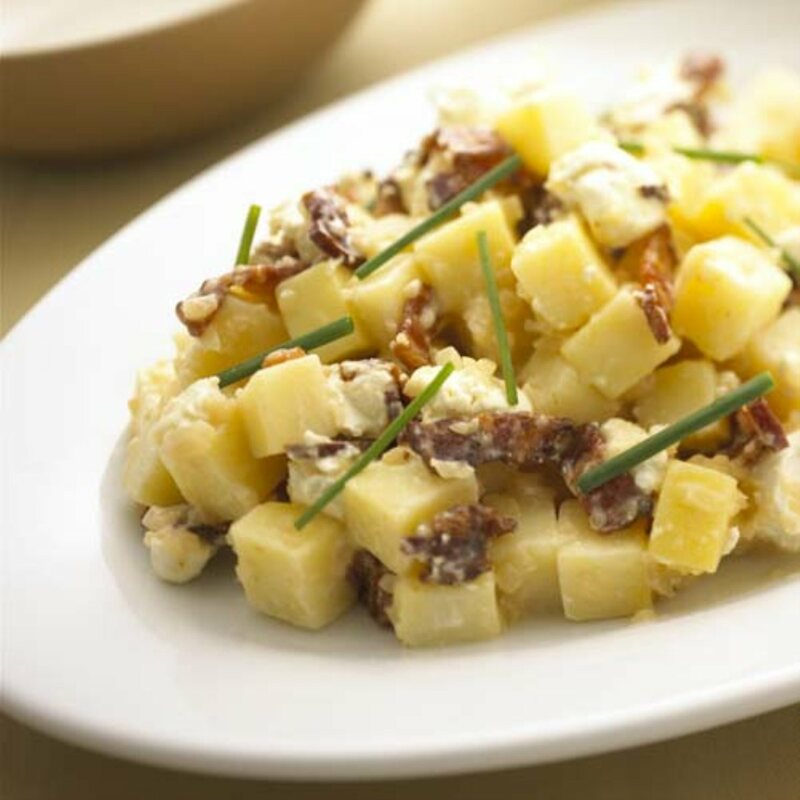 This is a classic German Potato Salad with a great new twist, fresh Goat Cheese! Great for Summer Grilling and Memorial Day! Place the potatoes in a medium-size pot and cover them with enough water to extend 2 inches above the surface of the potatoes. Salt the water and bring to boil over medium-high heat. Continue cooking until potatoes are tender when pierced with a fork, about 15 to 20 minutes. Drain and dice into 1/2-inch pieces. Set aside in a warm place. Cook the bacon in a large skillet over medium-high heat. Once crisp, place on a paper towel-lined plate. Pour off the rendered fat, reserving 1/4 cup in the pan. Turn the heat to medium and add the onion. Cook until translucent about 4 to 5 minutes. Whisk in the vinegar, sugar, mustard, and salt and stir until thick and bubbly. Add the diced, cooked potatoes and toss to coat. Top with crumbled Chavrie® Goat Log, bacon and garnish with the chives. Serve warm.